A naturally curved corkscrew and smooth spherical bottle stopper create an elegant gift for the wine lover. Both bamboo-accented pieces match their enduring storage box with magnetic closure, making this unified set perfect for any occasion. One Engraved Bamboo Storage Box. One Bamboo and Stainless Steel Corkscrew. One Bamboo and Stainless Steel Wine Stopper. Free Engraving! Three (3) initials or a monogram can be engraved, or choose your own personal message of up to three (3) lines of text. Enter information to be engraved using the personalization option during checkout. Measures 9" x 4" x 4". if ordered by 2:00 am EDT Monday April 22nd. Engraved Bamboo Wine Tool Set is a hand delivered gift. These gifts are delivered by one of our local design centers located throughout the United States and Canada. Same day delivery is available for most gifts when ordered before the cutoff time. The cutoff time for Engraved Bamboo Wine Tool Set is in the recipient's time zone. The engraved bamboo box transforms this wine accessory gift into a treasured keepsake. Engrave three initials on to the bamboo box lid. 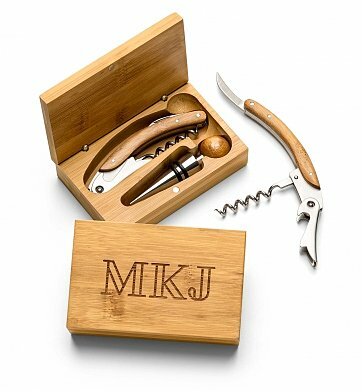 Contains a bamboo and stainless steel corkscrew and stopper.